Nearly a year ago Chase stopped accepting new applications for the Amazon.ca Visa and then late in summer 2017 they also stopped accepting applications for the Marriott Premier Visa card. Now we have received the news that both cards will come to a close on March 15 for existing cardholders. 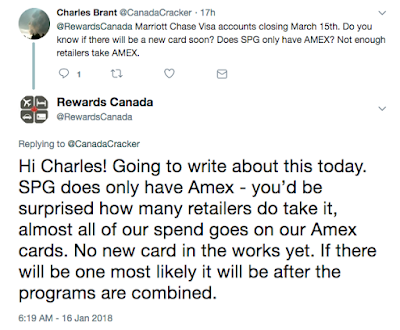 This will officially mark the end of Chase bank in Canada and any hopes of a Sapphire Preferred, Reserve or other great U.S. cards coming up here. Holders of both cards are starting to receive letters (we're still waiting on ours) or have called into to Chase and their representatives confirm the news. For Amazon cards, once all are closed on March 15 you will get a statement credit for your outstanding points. Both of these cards were very popular for their no foreign transaction fee benefit and the Marriott card for its large sign up bonus, free night benefits and elite status credits. There are still several cards in Canada that have no foreign transaction fee (HSBC Premier World Elite Mastercard and HomeTrust Preferred Visa are examples) if that is the main reason you had either of these Chase cards. For Marriott Rewards members who not only had the card for the foreign transaction but were using the card to build up your points account, you still have the option of getting the Starwood Preferred Guest Credit Card from American Express as Starpoints convert to Marriott Rewards Points at a ratio of 1 to 3. The card comes with a 20,000 Starpoint sign up bonus which equates to 60,000 Marriott Rewards points (that's higher than the Marriott Visa ever offered) and everyday earn is 1 Starpoint per dollar spent or 3 Marriott Rewards points per dollar spent. Remember the Marriott Visa was only 1 Marriott Rewards point per dollar on most spend (2 points for Dining, 5 for Marriott/Starwood stays) so you can see how the Starwood Preferred Guest Credit Card is better in many ways. The SPG card is also offering 2 Starpoints per dollar spent at Marriott and Starwood Hotels until the middle of February and we are hoping that is extended as the UK version of the card has the offer until the end of 2018. And you may ask, as we were on Twitter earlier today about acceptance and true Amex does have lower acceptance rates at retailers, it isn't that far off from Visa and Mastercard. In our household I would estimate 85-90% of our spending goes on American Express cards. You can visit this page we created for the American Express Cobalt card to see what retailers accept the card and you can even visit Amex's Shop Small website to see what non-major retailers accept the cards.